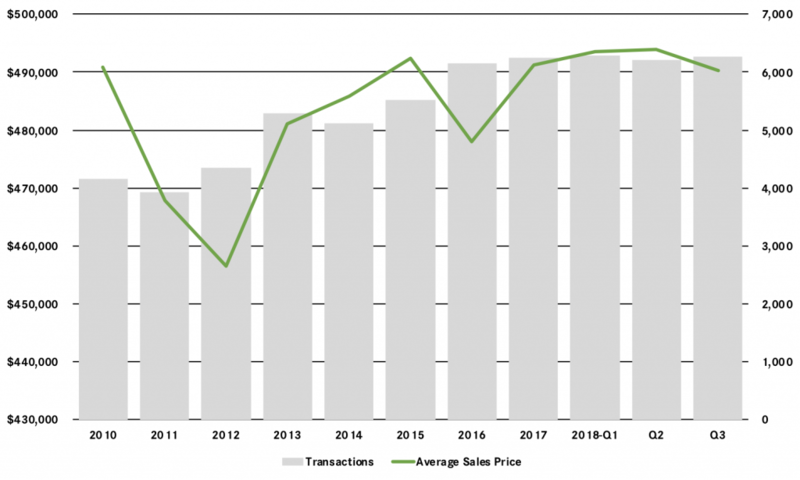 The Morris County housing market contained a series of contradictory indicators in the third quarter, with sales up, prices down, and the negotiability metrics suggesting increased leverage for sellers. Unlike most of the higher‑end markets in the region, Morris actually experienced sales growth, with sales up over 3% for the quarter, and the rolling-year totals relatively flat. But also unlike those other markets, Morris saw some price depreciation, with prices down almost 3% on average and 2% at the median. Meanwhile, the secondary metrics all pointed to increasing seller leverage: Inventory was down a tick, and now below the six‑month level that denotes a seller’s market; days‑on‑market fell again, and the listing retention rate was up just a tick. So what to make of the decline in pricing? Well, that might just be a blip, the result of some disproportionate strength in the middle‑ and lower‑range price points of the market. Indeed, if you look at the rolling year, prices are up nicely. Going forward, we will watch the pricing trend, but we do believe that demand is strong and will eventually drive more meaningful price appreciation through the fourth quarter and into 2019.